Florida. We may not be able stop this. We can still try. After Sandy Hook we know that the republican controlled Congress never will. The leadership of the @NRA has an agenda and it ain’t got a damn thing to do with gun rights. It’s 100% about gun sales. This Republican Congress is trading the lives of children for campaign contributions. We will win. This will not go on forever. 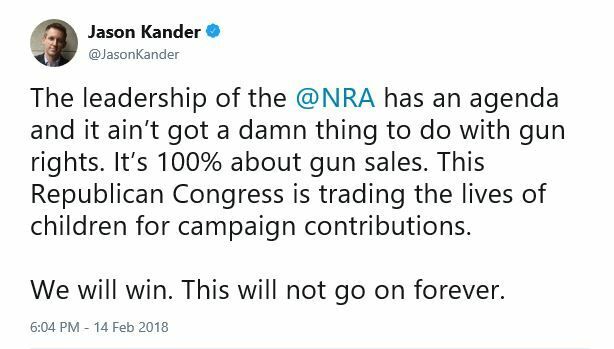 Do something because the NRA owned Congress won’t. If a candidate gets an NRA endorsement, don’t vote for them. Actively oppose them. If a candidate is mealy mouthed about keeping guns away from people who shouldn’t have them, don’t vote for them. Actively oppose them. If a candidate only offers “thoughts and prayers” as a solution, don’t vote for them. If you’re at a local political event and a candidate starts spouting NRA spin challenge them directly. Don’t vote for them. Actively oppose them. Make political support from the NRA toxic. Become a single issue voter. Make them own this misery. Shoud be every voters top of the list priority tto get the weapons off the streets. As exmilitary I know the consequences and also usderstand the situation we have now is not what the constitution enacted.